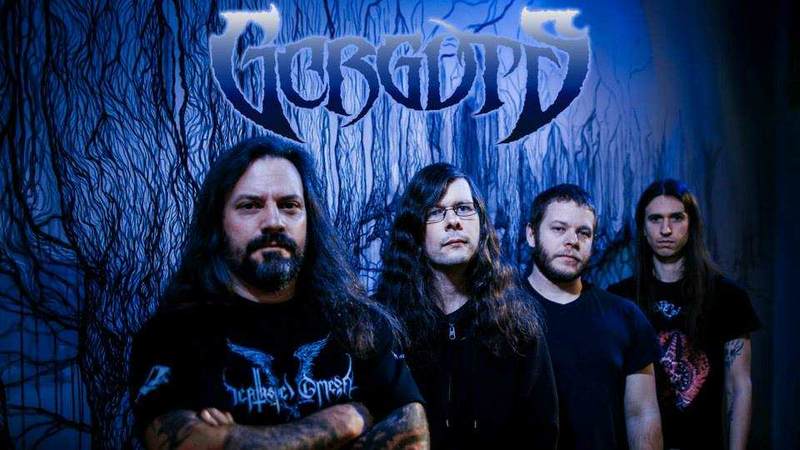 Exclusive interview with Luc Lemay of Gorguts! Agoraphobic News: Can you tell me something about the ,,Colored sands“ album cover? Is the idea like in the documentary that the hands of the Tibetan people are tied because they spent a years in prayer instead of action? LL: No, not exactly….The Idea behind the cover goes like this: the album concept is divided in 2 portions. The first 4 songs (illustrated by the praying hands) are about the spirituality, beauties and culture of Tibet. Then you have the instrumental which illustrates the Chinese invasion of 1950, Then the last 4 songs (illustrated by the tied hands) are about the oppression, the public immolations, and the questioning of non-violence philosophy of Tibetan people. Agoraphobic News: I guess “Colored sands“ is banned in China. Is that right? LL: I’m sure it is. Agoraphobic News: Steeve Hurdle suggested you to reform the band for its 20th anniversary. Is it true that he told you to ask Kevin, Colin and John to join the band ? LL: No not really. 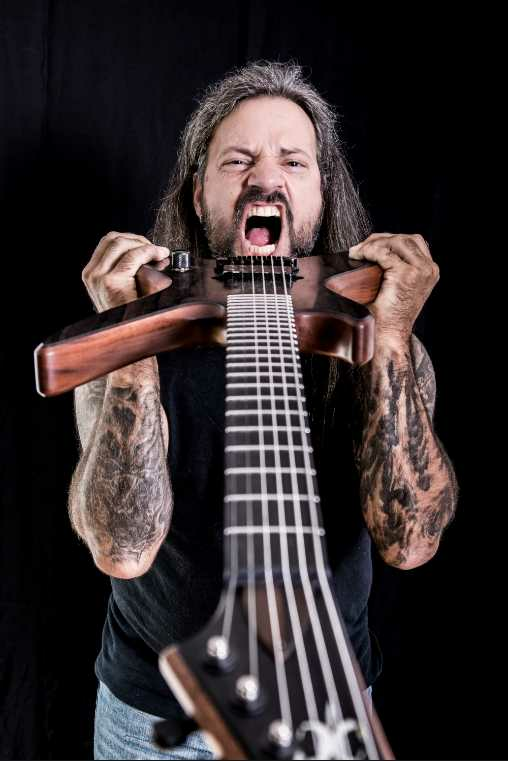 Steeve suggested me that I should do another GORGUTS record for the 20th anniversary of the band. I was already in touch with John, we were writing to each other once or twice a year. Colin was also my first choice for bass….but for guitar, Steeve wanted to be part of the band , at the time I was still doing NEGATIVA with him, so I decided that it was better to have somebody new to have a completely fresh start. So Steeve told me about Kevin and I was totally blown away by his skills and sound. Agoraphobic News: Recently i’ve discovered that Patrice Hamelin replaced John on the drums. Can you tell me something more about it? LL: John was really busy with ORIGIN and there was always schedule conflicts when GORGUTS was getting touring offers. So, Pat started to replace John, and we ended up playing more shows with Pat than John. It was a tough decision, but it became more practical to have Pat in the band. Also Pat lives about 1 hour from my place, so It’s easier for rehearsals. LL: I could not be happier!!!!!!! Our label, the press our fans……man!!!!! Everybody was sooooo generous fans supportive about the release. Everything was just great!!!!! Agoraphobic News: How did the writing process of “Colored Sands“ go? Some of the material was on the internet since 2009 (You and John rehearsing the song "Ember’s voice", and instrumental versions of Le toit du monde and Enemies of Compassion as well) I’ve discovered that you managed to record about 3 songs in a matter of days with the new line up, so i guess Steeve Hurdle’s pick was flawless. LL: The writing process when really smoothly. I was writing the music to a click. Then Kev and Colin would write their individual parts to. John and I would write the drums together. So when we got together as a full band everything was in place and when did very little tweaking there. By 2010 the whole record was fully written. The fact it took a long time is due to a legal mess that took 2 years to resolve. Agoraphobic News: I find lyrics to “Colored Sands” very interesting, but they can be meaningless to those who aren’t familiar with the topic. I guess that yоu’ve spent a lot of hours reading the books on this subject. Is it hard for you to write poetry in English since you’re mother language is French? Do you experience it as a burden sometimes? LL: Writing the lyrics has always been the part in songwriting that I find the more difficult for me. But, since I wrote the lyrics to COLORED SANDS I started seeing the process differently. I have a lot of respect for writers, people that devote a whole life to a pencil, a sheet of paper and a story. As you mentioned, the fact that I’m French, writing poetry in English in not an easy task neither. But for the topics on COLORED SANDS, I decided to include a quote, from books that I’ve red, so the listener can be situated in the context and understand what the song is about. Agoraphobic News: Do the lyrics affect your music ? For instance, a vocal line that you write can force you to change the riffs for the sake of a vocal line. In order to avoid that you can write songs as instumentals first and then start to write vocal parts, so the real question is do you write the music first, or the lyrics, or the process is combined? LL: I always write the music first. And the music has to work as an instrumental. It’s not like a part sounds boring or too long and say: “ah, with vocals it’s gonna be OK….” Never!!!!!! So, all the music first, then the vocals. I even find the rhythms of the vocal lines first and then I write my phrases according to that. For COLORED SANDS I waited for the whole record to be written before I wrote a single word to it. This way I could devote my mind to the storytelling aspect. Agoraphobic News: You are an educated musician. Do you sometimes struggle with overthinking when writing your music? What i really like about Gorguts is that almost every riff has some detail that gives a unique feel to it, and music as a whole is pretty layered, which is also a good thing. LL: I don’t let the academic side to take over the emotion. I’ve always omitted to learn the notes on the guitar fret board I don’t do any association to scales or chords. There’s a good saying that I’ve learned at the conservatory in the harmony class saying: “ the first thing to do when you when through the learning of 4 parts harmony rules book….is to forget about it ”. That brings you a perspective of layering, ect….it’s not cause you know about all those rules that you’ll be a better composer….music is about melody, emotion….not about a rule book. Agoraphobic News: Tell me something about instrumental piece “ Battle of Chamdo“ Did you write this composition solely by yourself? It sounds really dark and it reminds me of some horror movie's soundtrack. It would be really cool to hear this composition in some documentary about Tibet in the future. LL: Yes, I wrote that myself. I’ve always love string orchestra music, so I thought that would be a very good fit for the images I wanted to bring to the listener. Agoraphobic News: ) As a whole, “Colored sands“ sounds really organic. Is it hard for you to align the songs in a correct order? Personally, i think that the album must have a good and dynamic flow. For instance, An ocean of Wisdom + Forgotten arrows + Colored sands is really good combination. LL: The pacing of an album is very important. It’s important as the riff order in a single song, or the chapters order in a book. I don’t understand the younger generation that will listen to their I POD on shuffle. A record is like a book or a film. Agoraphobic News: Absconders and Reduced to Silence stands out for themselves when compared to other songs of the record . Did you write them last? LL: REDUCED TO SILENCE was a song that I had in my drawer for a while which I re-arranged the structure for the record and ABSCONDERS was written by Kevin. Agoraphobic News: Is there any song on the album that was written by Colin or Kevin? LL: Colin wrote FORGOTTEN ARROWS and KEVIN wrote ABSCONDERS. Agoraphobic News: Obscura is one of the records that turned the world of music upside down. It was an album ahead of its time and it really is a pitty that Obscura was waiting about 4 -5 years to see the light of day. You also had a problem with Roadrunner (Fear factory, right?) and then Steve McDonald left the band. Are you happy with the final product after all those years of waiting to record Obscura? LL: The record took along time to get released cause we didn’t have a record deal when we wrote it. Then we were shopping for a deal and nobody was interested in these compositions. It took 5 years to get things right so we could finally record the album. Agoraphobic News: What did you try to achieve with that album? LL: Write the music that we wanted to hear. We got sick of traditional DEATH METAL pretty quickly and we didn’t have any interest of writing EROSION part 2. Agoraphobic News: In 1995. you were supporting for Death. That was surely a great experience. Tell me something about that. LL: That was a great show for us! I t was a single show at the Montréal SPECTRUM (which doesn’t exist anymore). If my mind is right we got asked to play the show like a day before or something also I think it was the first time for us that we performed music from OBSCURA live in Montréal. Then a month later we moved the band to Montréal. It was a great evening, getting to talk with Chuck and Gene. Great memories! Agoraphobic News: Tell me something about Steeve Hurdle and his contribution to the writing of the Obscura album. I guess that he wrote some music and lyrics as well. 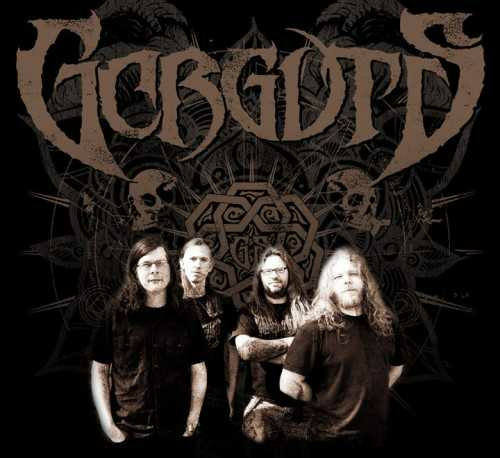 Agoraphobic News: Who was behind idea that Gorguts should have more dissonant sound with contrapuncts and a noisy aproach to the music? LL: We all did. We deliberately approach our instrument in a way that was ANTI traditional metal playing. We each agreed that neither fast picking riffs nor power chords would be accepted in the music. So by insisting on those restrictions, we were forced to come up with a new musical language. Agoraphobic News: Lyrical theme of the album is about some mixture of nihilism and hinduism( correct me if I’m wrong) , and they have something to do with the Indian guru Osho Rajneesh. Tell me something about it. My personal favorite is La vie est prelude...le mort – orgasme. Who wrote lyrics for that song? That vocal duo is breath taking! It gives me some theatrical feel to it – Steeve on the first strophe and then you kick in like a flash of lightning! LL: Like I mentioned, this was inspired by Osho’s books…..Steeve would bring the theme and we would agree on who is gonna sing where then we would each write our lyrics without showing our ideas one to the other. Then once the song finished, we would put both of our lyrics together and it was like one person wrote the whole thing. LL: He was a poet, very interest in Hinduism. His music tastes would go from DEAD CAN DANCE to BATTLE OF MICE. He would always come up with an idea that you never expected. After I left NEGATIVA, I never got involved in any decision regarding this band. This was Steeve’s project. He had back problems for years which always go worse. Then he got very sick with diabetes…So one day he went for a back surgery and that where he died, on the surgery table. Agoraphobic News: What are your biggest metal and non metal influences? LL: I love: Opeth, Katatonia, Ghost Brigade,Neurosis, Lustmord, Foo Fighters, Voivod, Machine Head, Slipknot, Porcupine Tree, Trent Reznor, Penderecki, Shostakovich, Schnittke, Kalevi Aho, Bach, Telemann, Gesualdo,….to name a few. Agoraphobic News: Are there any albums that changed your way of thinking music-wise? LL: “Dark places on earth” by LUSTMORD, “The Incident” by PORCUPINE TREE, “Blackwater Park” by OPETH. Agoraphobic News: Are you in contact with Dan Mongrain and Steve Cloutier? They are both great musicians. LL: Unfortunately we don’t see each other anymore. Agoraphobic News: Is it hard for you to pick songs for the setlist and which Gorguts song you find the hardest to play live? LL: The hardest material for me is the music from “The Erosion Of Sanity”. I don’t write in this style anymore, so it’s always difficult for me to play these songs. Agoraphobic News: Do you find metal music challenging to play if you have in mind that a lot of people wouldn’t even give it a try because of vocals? LL: Yes, I agree, it’s a challenging style to write and play. I find that extreme music like DEATH METAL is one of the most creative and refreshing type of Metal. Agoraphobic News: Tell me something about your touring experience. 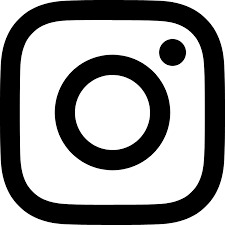 Do you like to play in small clubs or at large festivals? Touring enables you to meet a lot of people and see a lot of countries. Who are your favorite bands to tour with and which countries you liked the most ? LL: I absolutely loved all the bands that I’ve toured with in the past. I got great friendships with most musicians and it’s always a pleasure to see each other years later. I love the camaraderie in Metal. When ever I stop playing metal that’s gonna be what I’ll miss the most from it, the friendships with other artists. As far as countries I really love Eastern Europe, Japan, Australia….I love touring the US as well. I think the US has wonderful landscapes and great people. Agoraphobic News: How do you feel about music industry today? Did record labels force you to write and finish your albums faster than you expected? LL: No, not at all. We respect our own pace and it’s ready when it’s ready. Art is not made to be rushed. Agoraphobic News: Not many bands are influenced by the eastern culture. A few bands that come to my mind are Nile, Melechesh, Om and Gorguts. Obscura and Colored sands include eastern practices such as Hinduism and Budism, while From wisdom to hate has to do something with Ancient Mesopotamian civilaziations. Even some riffs on Colored sands have that eastern feel to it (Ocean of wisdom for instance). How did you get interested in these topics? LL: Well, it always happen by accident….One day I end up having books dealing with each of the topics you’ve mentioned. It mainly starts with books. Books are windows to the world, culture, Art and anything you want. I’ve never been to Tibet…but with the use of books I was able to answer the questions I had on this topic and fulfill my passion for it enough to write a whole record on this wonderful culture. 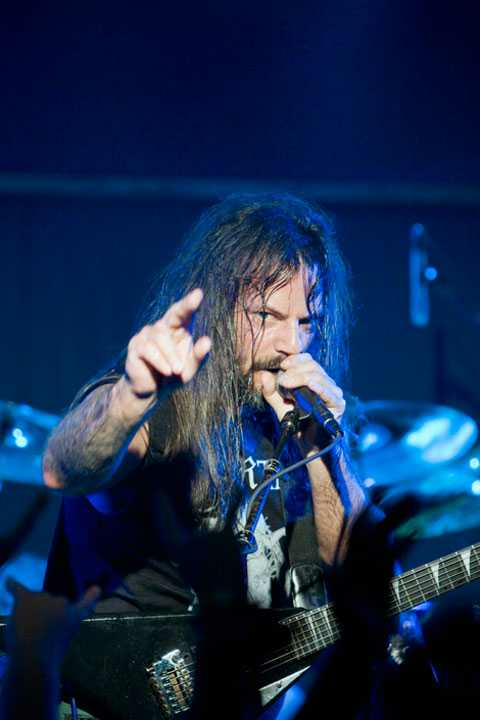 Agoraphobic News: When can we expect a brand new Gorguts album? LL: By the end of 2015 or early 2016. I have already 2/3 of written. The next record is gonna be a EP. I’ve been wanting to do a EP for a long time. It will be a single track of about 30 minutes…Very dark, ambient, intricate with crazy bass and drum parts!!!!!! I’m totally stoked about the music and I can’t wait to share it with all the fans!!!! Agoraphobic News: And the last question must be goofy – WHERE CAN I BUY MY OBSCURA HOODIE?